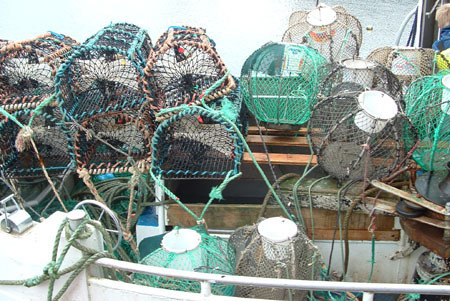 As most fishermen or recreational fishermen I wonder; what type of lobster pot is the best? In Norway some fishermen swear to the round «atom-pot» (see photo abowe). This pot is easy to haul and the entrance is placed on the top of the pot. Some still prefer the traditional wooden pots formed as a long box (see photo below). These pots are also used for fishing crabs. These pots has two entrances, one on each of the short sides. 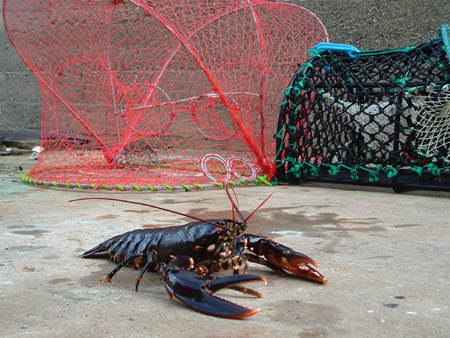 Still there has been a small revolution regarding the lobster pots in Norway. The Scotch lobster pots has become a new favorite. 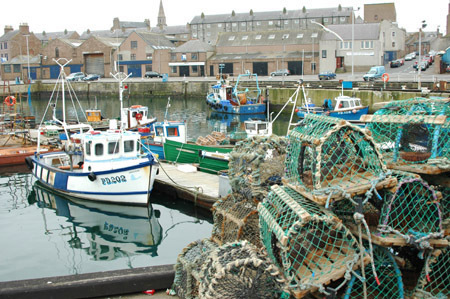 These pots were originally made of wood, and wooden pots are still used (see photo below showing pots in Peterhead). Now these pots are made of iron reinforced with plastic. 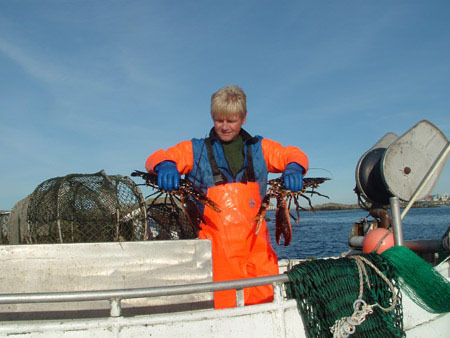 Around the beginning of this century the first Scotch lobster pots were introduced in Norway, and they soon became a favorite. 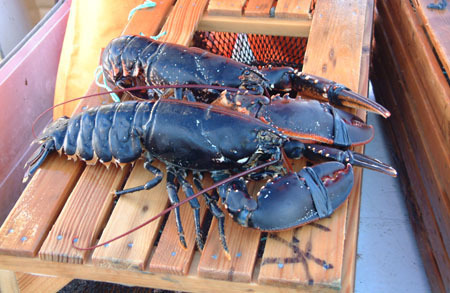 They are heavy, solid and they do their main task; catching lobsters. The biggest Scotch pots (on the photo abowe to the lefte) with two chambers are too heavy to haul by hand but these pots are now dominating the Norwegian market. For me and other recreational fishermen there are several types of light folding pots. These pots are also relatively new on the marked but they have proved to do their job well. My favorite can be seen on the photo below. To the right a Scotch pot with one chamber (heavy), and to the right a cheap and light pot fold up. The Second World War may have had a positive impact on the Eastern Atlantic stock of bluefin tuna. War at sea stopped the fishermen and the tuna could migrate to the spawning grounds and spawn in peace. This may be the reason why large shoals of young bluefin tuna was found outside the Norwegian coast in the early 1950’s. 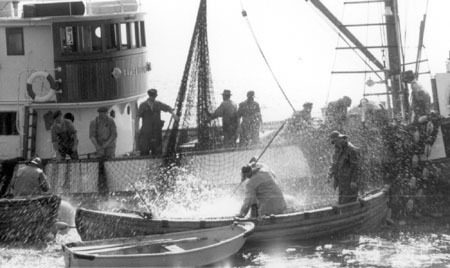 1952 was an exceptional year for the Norwegian vessels fishing for tuna. Along the southwestern coast of Norway the sea was full of young tuna, weighing 50-70 kg. The large shoals represented an adventure for the fishermen. Hundreds of tunas were trapped in each catch. Sometimes the seine could not hold the powerful fish, giving the crew a lot of work repairing the seine. Off the coast of Haugesund the bluefin tuna made the sea boil. On the photo above you can see the result from a catch of 607 tunas. 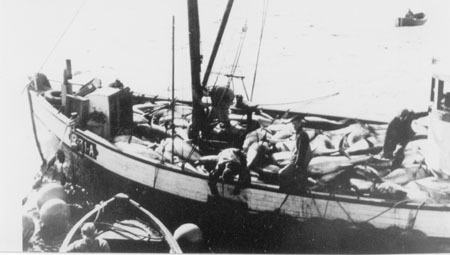 A seiner with a nice catch in 1952. An other vessel assists the seiner. 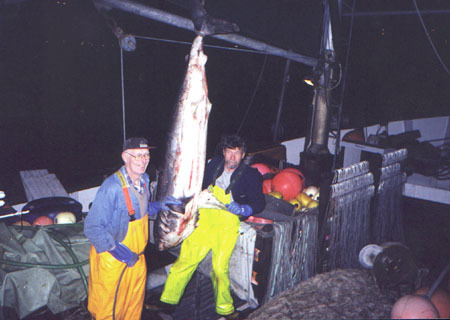 Further north in Norway larger tuna were caught. Also in 1954 young tuna visited Norway. The shoals then came to the southeastern coast (near Oslo). 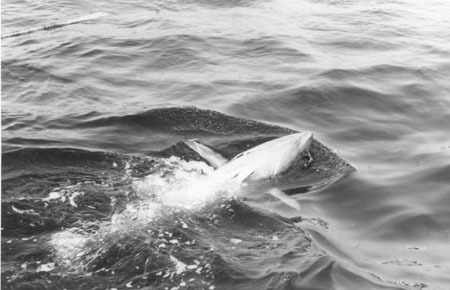 This tuna was very small – only 20-40 kg, suggesting a strong class from 1950. 1954 was the last year small tuna migrated to the Norwegian coast. Bluefin tuna from those strong classes kept coming to Norway each summer, and leaving the coast in October. 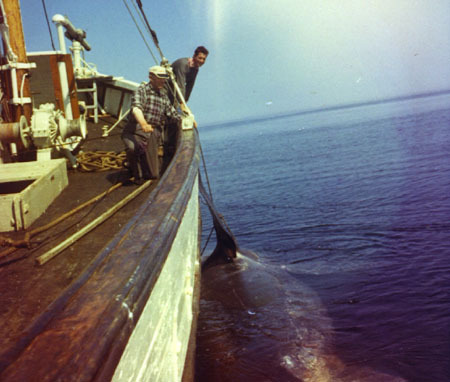 In the 1970’s the same fish was weighing 250-350 kg. As the years went by the strong classes were fished down and that put an end to the tuna fishery in Norway. Here are some photos from the 1970’s. The basking shark was then a common fish in the North Sea, and fishermen from Norway had hunted them for decades. The photos on this page show five different vessels. 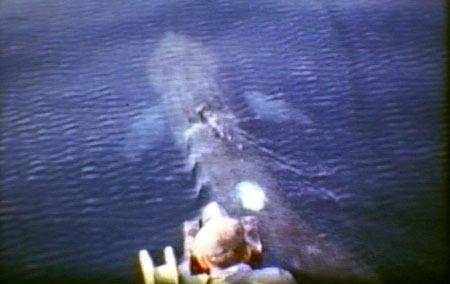 Above you see a vessel closing in on a basking shark, just a second before the harpoon gun is fired. 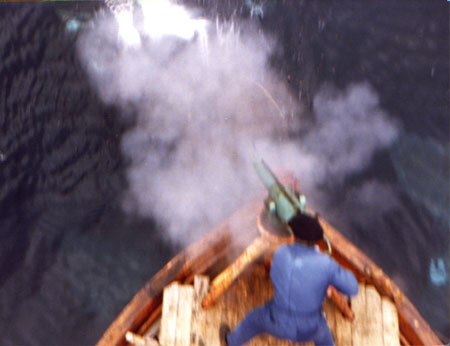 The vessel is shaking as the harpoon gun is fired. The vessel forces the large shark to the surface. Again the vessel shakes as the shark tries to dive. The fishermen used a rifle to kill the shark – a shot in its head. 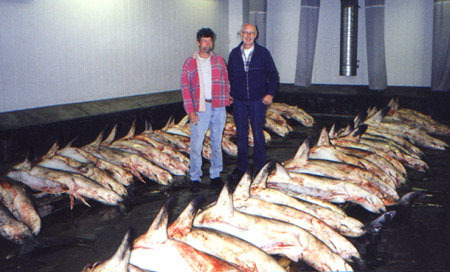 The shark was then hauled towards the boat (see photo below). 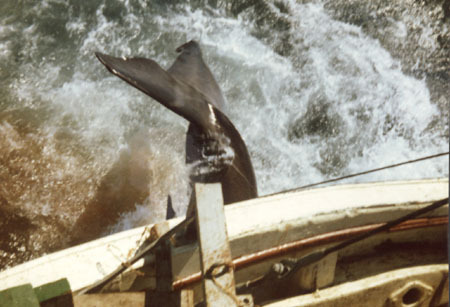 The harpoon was removed, and the fishermen used large knives to cut of the fins and to remove the valuable liver. 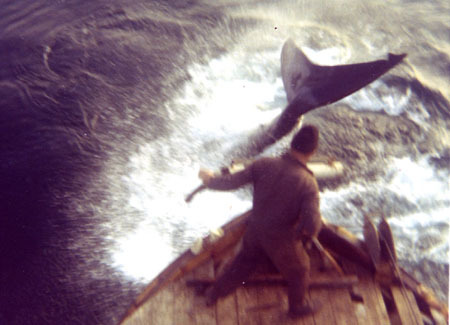 These photos are historical; it is no longer allowed to hunt for basking sharks in Norway. More photos and information about this fishery can be seen on this page. 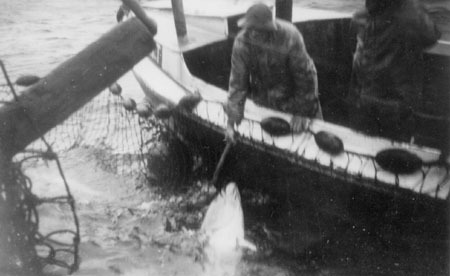 Fishing for porbeagle was an important fishery for many Norwegian fishermen. 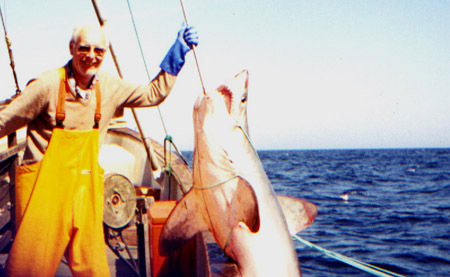 The decline in the stock in the 1970’s and 1980’s made most fishermen to give up this fishery. A couple of vessels maintained the tours to The North Sea during the 1990’s, and one of these was «Randi» from the souther part of Norway. On the photos on this post you will se sharks and the crew; Ragnar Govertsen and Tore Hæstad. The photos were taken in the late 1990’s and this vessel is no longer fishing for porbeagles. The vessel used long lines, placed near the surface. The lines were floating/drifting freely and the vessel patrolled along the line to see if a porbeagle shark had taken the bait. Then the crew started to haul the actual part of the line. The shark was then cleaned and stored on board with ice. This vessel used a long line with 500 fishing hooks. A trip to The North Sea lasted for 8-12 days. The catch were then landed in Hanstholm in Denmark. 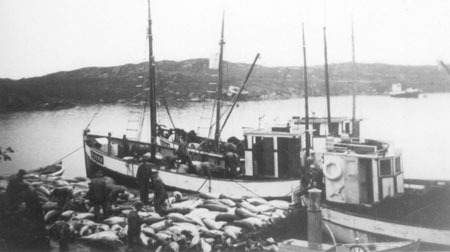 Below a photo showing the crew and the catch. All photos on this page is given by the crew. How do you tag a big fish weighing over 200 kg? This was the challenge given to the Norwegian scientist Johannes Hamre. In the 1950’s fishing for bluefin tuna became an important fishery for many Norwegian fishermen. Tagging tuna should give the scientists more information about the bluefin tuna, its growth and its migration pattern. The tuna is depended on a constant flow of water over its gills in order to get enough oxygen. While caught in a seine, the tuna will die as the seine is hauled in – preventing it to swim. Tagging tuna was therefore a difficult task; both to place the tag and then releasing the tuna before it died. 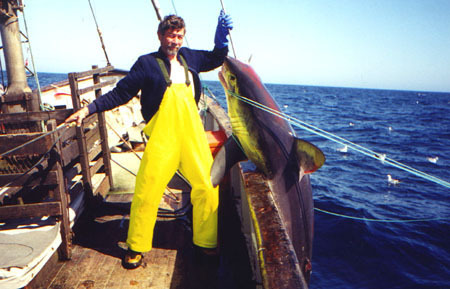 A Norwegian bluefin tuna seiner with a catch in 1959. Johannes Hamre has left his small rowboat. He is here aiming for a fish with his tagging-stick. The tuna is panicking and it was not easy to place the tag and then releasing the same fish. A bluefin tuna is tagged and released. The lack of oxygen while caught in the seine has made the fish dizzy. 42 bluefin tuna were tagged in 1959. 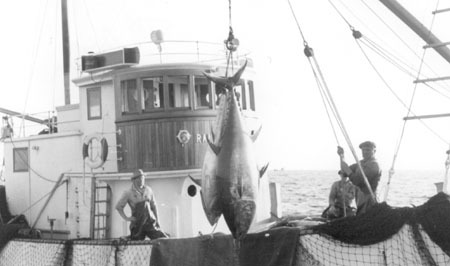 Some of the tunas tagged in 1957, 1958 and 1959 were later caught in foreign waters; outside Spain, Portugal, Denmark and Morocco. Most of the tagged fish were though caught by Norwegian fishermen outside Norway. The scientific work done by Harme also included biological samples and collecting data from the fishery. His work on the bluefin tuna represents the best data we have of the bluefin tuna stock in the 1950’s. 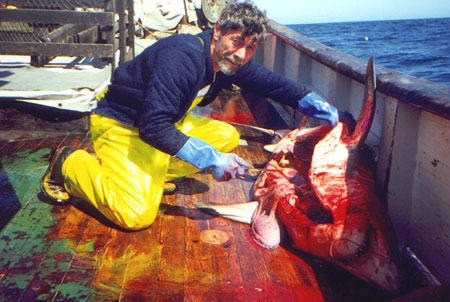 Even today his work is studied to learn more about this big fish – now suffering from decades with overfishing.